“There is hardly anything so elusive,” writes the celebrated Irish poet Eavan Boland, “as the way in which a poetic inheritance is sifted and re-arranged from one generation to the next.” This collection of essays tracks and illuminates poetic inheritance, specifically the legacy of women poets and poetry that transcends or speaks back to poetic convention. 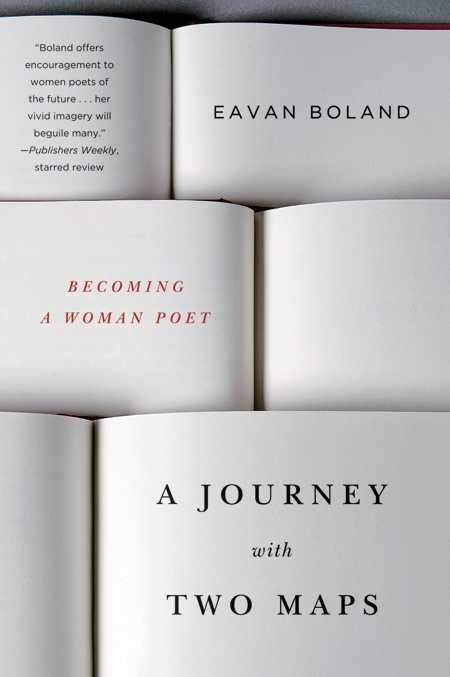 Boland shares her own poetic development freely, and her open tone makes it easy for the reader to accompany her as she explores poet after poet, excavating the intersections of personal and cultural history that created both the poet and her place in the canon. She translates a poem by the German poet Elizabeth Langgässer, for example, and in the process tracks down the searing experiences that inform the poem’s leaps. Her reexamination of the work and historical treatment of Elizabeth Barrett Browning and Eibhlín Ní Chonaill results in a richer understanding of the poets, their work, and the process of translation that can hide poets from modern view. In the second half of the book, the essays focus on particular poets, including those who seem to have been lost or discounted—Edna St. Vincent Millay and Charlotte Mew. She illuminates lesser-known aspects of poets like Adrienne Rich, Elizabeth Bishop, Sylvia Plath, Denise Levertov, Gwendolyn Brooks, and Paula Meehan. Boland is searching for a context for her own poetry, for a vocabulary that will articulate the sources of beauty and mystery in an ordinary life and not only in the sublime. She needs to “believe in my life as the source of the language I used, and not the other way around.” The domestic poem, historically dismissed as a lesser genre, becomes “counter-history” in Boland’s eyes: a gesture of reclamation and a vital source of light and insight. She is interested in resistance, which becomes a way “of attaching [the] poet to the world, not repudiating it.” She ruminates on the collision between notions of individual versus collective authorship. The “perilous and crucial process” of translation is both obstacle and tool, as Boland uncovers lost layers of meaning. For Boland, poems are “a vast root system growing down into ideas and understandings” that taps “into the history and evolution of art and language.” Whether poets draw on or challenge a collective past, the connection is certain. This holistic vision is characteristic of Boland’s work and gives these essays life beyond the page. Boland is a prolific author, with over twenty books of poetry and nonfiction, and directs Stanford’s creative writing program. This accessible, stimulating collection is an important addition to any public and private poetry or history collection.